Start with a bowl of Japanese seafood rice, continue with frozen yogurt, and finish with a freshly brewed Italian coffee. The Food Hall on the ground floor of Bangkok’s Siam Paragon is home to some 50 carefully selected restaurants that offer a myriad of dining opportunities. The three most recent additions to the hall are Hokkai-Don, with its rice bowl dish concept, and two leading brands from the UK: yoomoo, the frozen yogurt chain, and Costa Coffee, established in London in 1971 by Italian brothers Sergio and Bruno Costa. Rice is Japan’s most important crop, and a bowl of it is a central part of the country’s cuisine. “Hokkai” refers to the place where many of Hokkai-Don’s fresh ingredients come from: Hakkoda, Japan. 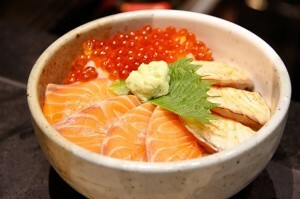 The suffix “don” is the short version of donburi: a simple and fast Japanese meal consisting of a bowl of cooked rice topped with a variety of meat, fish, and vegetables. Many restaurants in the outer zones of Tokyo’s Tsukiji fish market sell it as a popular option for lunchtime. Hokkai-Don is the first restaurant in Thailand to serve this style of Japanese dish, offering it as an alternative to the traditional sushi and sashimi preparations. Being at the restaurant feels like being seated at the edge of a pier, where fishermen bring their catch back from the sea to be served fresh. Targeting both Thai and foreign customers, the dining room’s rustic light wood bar surrounded by tables could make commensals forget they are inside a food court. The branch occupies 53 square meters. A second location to be opened next year at EmQuartier shopping mall will have double the floor space, and it will cater more toward Japanese customers. Hokkai-Don is all about fresh ingredients: mackerel is imported daily from Japan; soy sauce is boiled to caramelize its natural sugar and give it a sweet taste; rice is grown locally by a Japanese farmer who lives in Chiang Rai, and its flavor is authentic, as the rice has been cooked with mirin and then allowed to cool, a key step in improving taste. The restaurant also serves a clear soup made from fish trimmings, as opposed to the classic miso soup usually served in Japanese restaurants. We tasted three rice bowls: the Double Salmon Don, topped with ikura, fresh salmon, and grilled salmon; the Ume Don, with maguro, hokkigai, hotate, ikura, kanikama, and uni, and the Aburi Don, with maguro, engawa, hotate, ikura, salmon, and tamago. A tip from the chef is to eat the seafood as soon as it’s served because oxidization will quickly reduces its flavor and color. 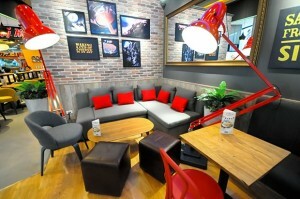 This is Costa Coffee’s 1,000th branch outside the UK. Its coffee is a unique blend of Arabica and Robusta beans that are slowly roasted with no direct heat contact, to avoid burning. A total of 6,100 metric tons of this blend, known as “Mocha Italia,” are roasted every year in Lambeth, London, to be sold in 2,500 stores in 30 countries. Costa Coffee’s beans are selected from farms that are certified by the Rainforest Alliance, and the company’s mission statement is “to save the world from mediocre coffee.” Among other policies, they accomplish this by having their baristas make 1,000 cups of coffee before leaving school, and by teaching them to have the confidence to serve a perfect cup every time, using only machines imported from Italy in order to get the right taste and showcase the quality of their medium roast coffee beans. While studying business at the University of Bath in the UK, Pattrinee Anuwongnukroh, brand manager of yoomoo Thailand, discovered this premium frozen yogurt and fell in love with it at the yoomoo bar on the 4th floor of Harrods department store. Yoomoo is fat-free, gluten-free, made with fresh British milk, a rich source of calcium, and with no nasties allowed. Picking up on the trend that Thais are slowly changing their eating habits to more healthful, fat-free diets, Anuwongnukroh spent a year putting her business plan together to now share her “love affair” with Bangkok. 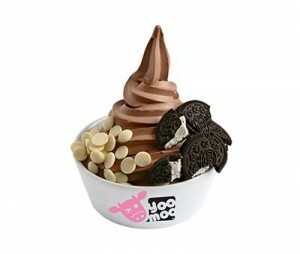 Yoomoo is probably as close as it gets to a guilt-free dessert, and it comes in an assortment of flavors. You’ll find yoomoo frozen yogurt in the form of Devilmoo, chocolate frozen yogurt with swirls of chocolate sauce and rich brownie chunks, topped with milk chocolate stars; Tropicoolmoo, with juicy mango and passion fruit sauces, topped with tangy freeze-dried mango puree pieces; Strawbswirlmoo, with strawberry sauce and with freeze-dried strawberry pieces; and Veryberrymoo, natural and blueberry fro-yo topped with mixed berries, granola, and swirls of raspberry sauce. The list also includes Cherrychocmoo, Vanillamoo, and Nakedmoo, a natural flavor you can use to create your own unique taste, among many others. On the 4th floor of Harrods, a regular portion of Yoomoo’s frozen yogurt costs GBP 5.50 (THB 270), while the same serving size costs just THB 199 in Bangkok. And because the portions are generous, one of them could easily be shared by two dessert lovers. Our tip: eat first and talk later, as frozen yogurt melts quickly.